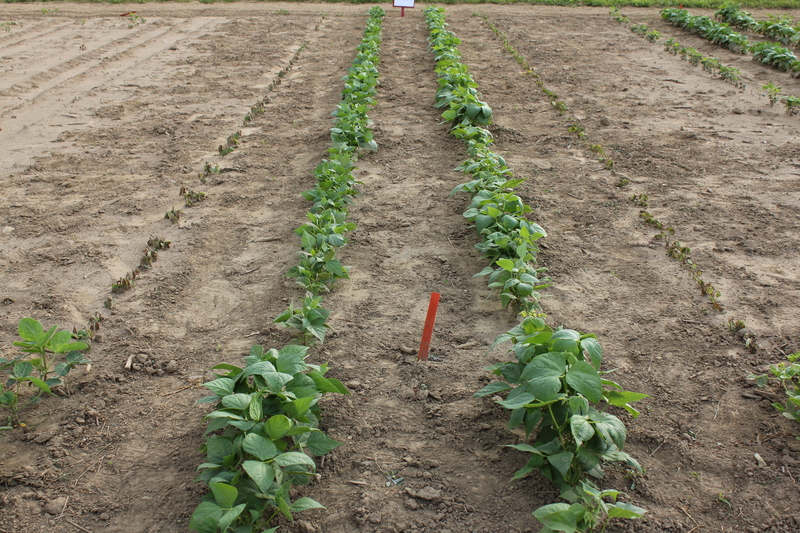 Here is a summary of herbicide injury scenarios in soybeans (glyphosate tolerant), white beans, kidney beans and adzuki beans showcased at the South West Crop Diagnostic Days in Ridgetown on July 6th and 7th, 2011. Sandea (halosulfuron) is currently not registered in Ontario. Above is a post-emergent application of the 70 g ai/ha rate of Sandea, which represents an overlap rate (2X) of the product. Note that soybeans and adzuki beans are significantly affected (or perhaps dead is a better description). The white and kidney beans on the other hand are slightly stunted. The intended use of this product will be in certain market classes of edible beans (clearly not adzuki beans), and most likely applied prior to crop emergence. Sandea is a sulfonylurea herbicide (group 2) and the soybeans best show the characteristic reddish/brown veins on the underside of leaf tissue, along with stunting (see below). sulfonylurea (group 2) injury in soybean, note the reddish/brown leaf veins. This scenario illustrates two significant points. The first is that Broadstrike RC is not registered in edible beans at all and for good reason as edible beans are extremely sensitive to most sulfonylurea herbicide when applied postemergence. In scenario 1, you’ll recall that we saw the typical “group 2” injury that caused brownish/red veins on the underside of leaves. 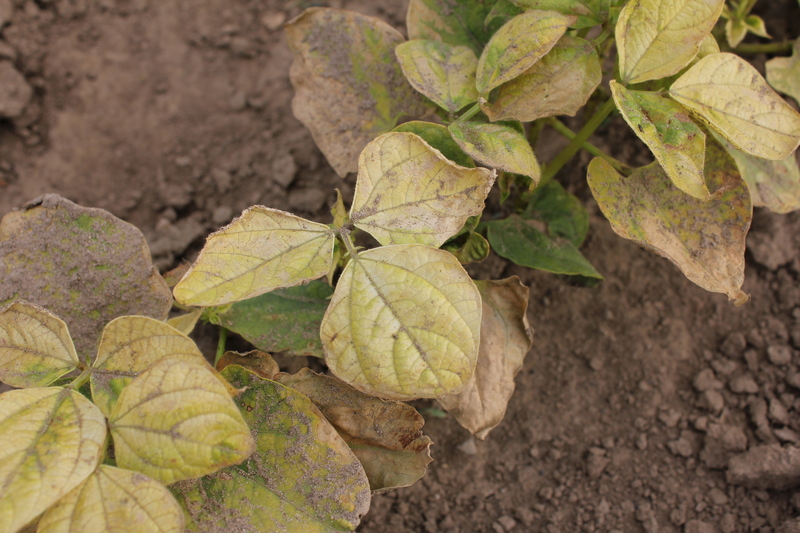 Other common “group 2” herbicide injury symptoms include yellowing and distortion of leaf tissue along with stunting. 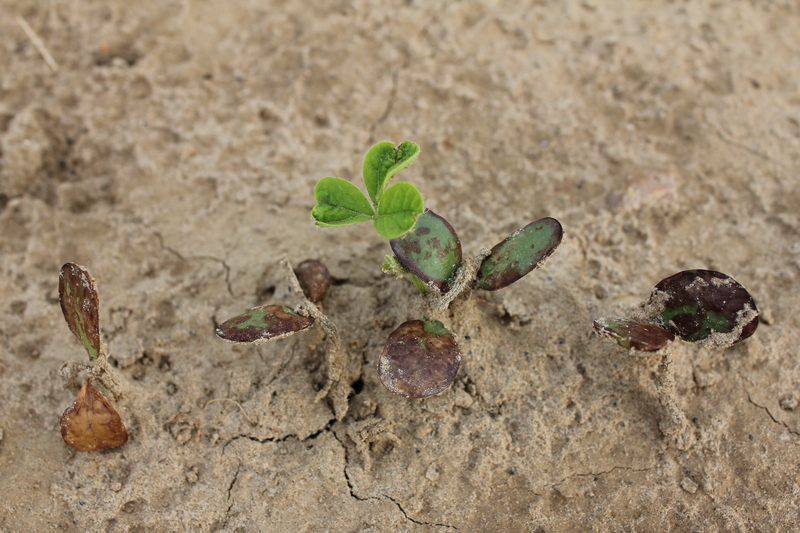 Secondly, Broadstrike RC should only be applied to soybeans prior to their emergence. This application was mistakenly made at the unifoliate stage. Although the soybeans will not die, there was a significant amount of leaf distortion and yellowing. Injury caused by Broadstrike RC applied to emerged soybeans, an off-label application causing significant leaf distortion and yellowing. In this scenario Valtera (flumioxazin – group 14) + Dual II Magnum (s-metolachlor/benoxacor – group 15) was applied at an overlap rate (2X field rate). 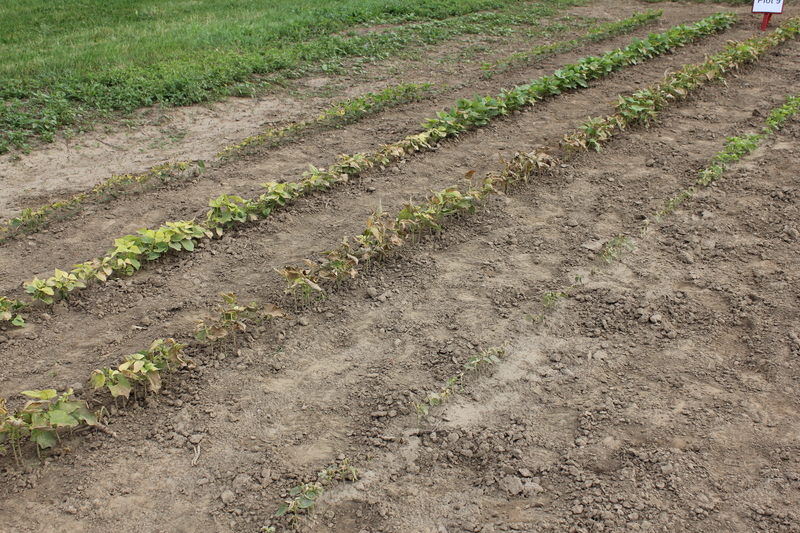 Edible beans are quite sensitive to flumioxazin so it is not surprising to see the level of crop injury shown above. 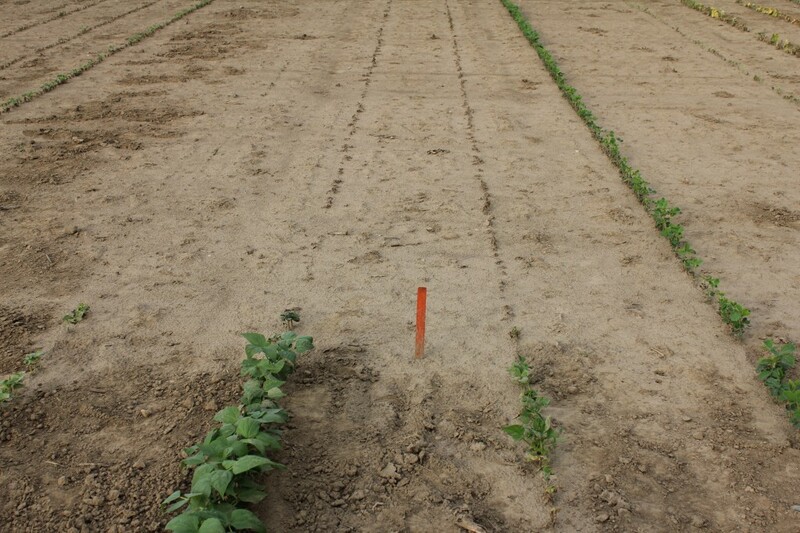 Both herbicides are registered for use in soybeans when applied prior to emergence. However combining these two products in a tank-mix dramatically increases the potential for Valtera injury (see below). There are several other factors that increase the potential for severe flumioxazin injury and were discussed in a previous post. 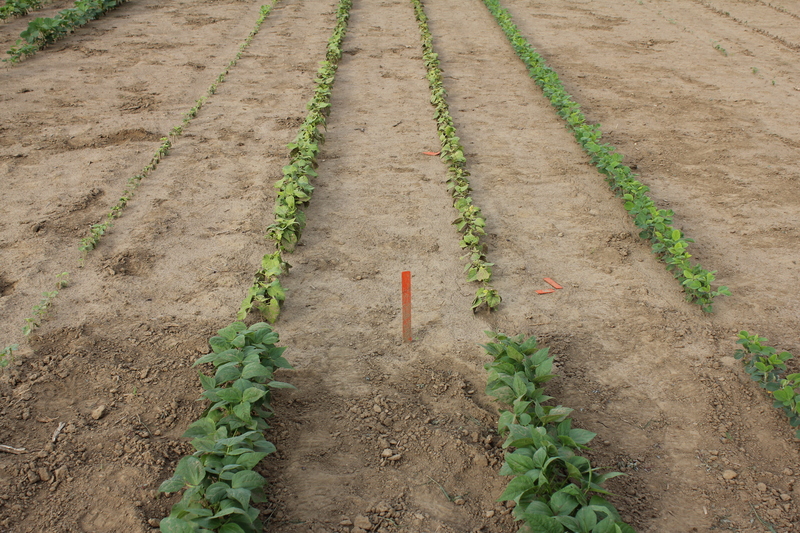 Eragon (saflufenacil – group 14) was tank-mixed with Valtera (flumixoazin – group 14) and applied at the field overlap rate (2X field rate) prior to bean emergence. Then at the first trifoliate stage, Reflex (fomesafen – group 14) was applied. This scenario illustrates how we can compromise a plant’s ability to metabolize a specific mode of action by over-whelming it with multiple herbicides that all affective the same site of action. Although, in this case we targeted group 14 herbicides, the impact to the crop would be similar had we combined 3 “group 2” herbicides. Simply put, a plant can only handle so much. Below is another example of severe “group 14” herbicide injury. The combination of applying Eragon + Valtera prior to crop emergence and Reflex post crop emergence lead to severe group 14 injury as the plant could not adequately metabolize all that was thrown its way. Scenario 5: I can’t keep these co-packs straight! The number of combination or “co-packs” in glyphosate tolerant crops is pretty overwhelming, and they all seem to have similar names (and oddly all starting with the letter “G”). 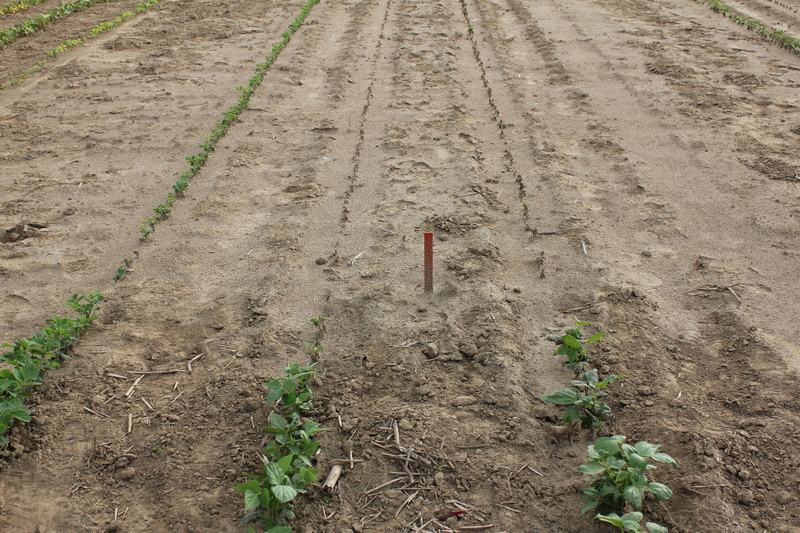 The image below illustrates a mistake where a corn herbicide co-pack of glyphosate + Elim (rimsulfuron – group 2) was inadvertently sprayed on soybeans. 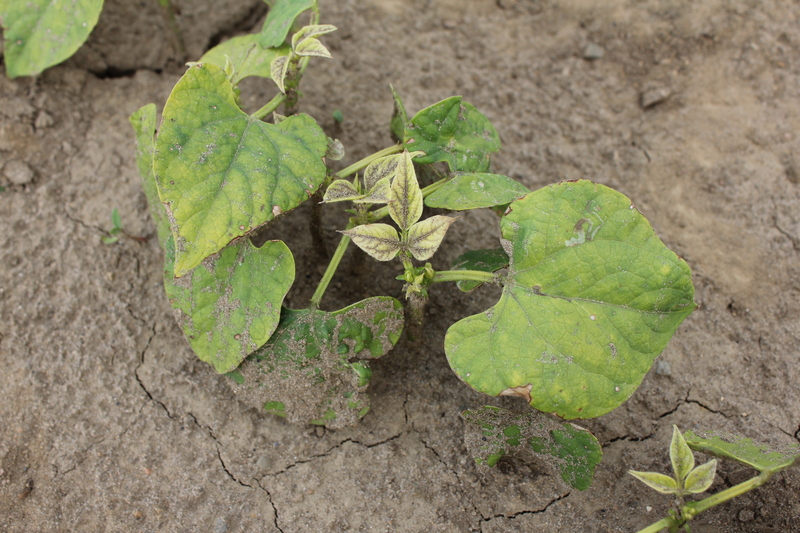 The below image shows perfectly the injury symptoms of stunting, yellowing and reddish/brown veins that one will see with severe sulfonylurea injury in soybean. Stunting, yellowing and reddish/brown leaf veins from severe "group 2" herbicide injury, in this instance caused by mistakenly applying rimsulfuron, a corn herbicide. Scenario 6: By sure to follow application instructions on the label. 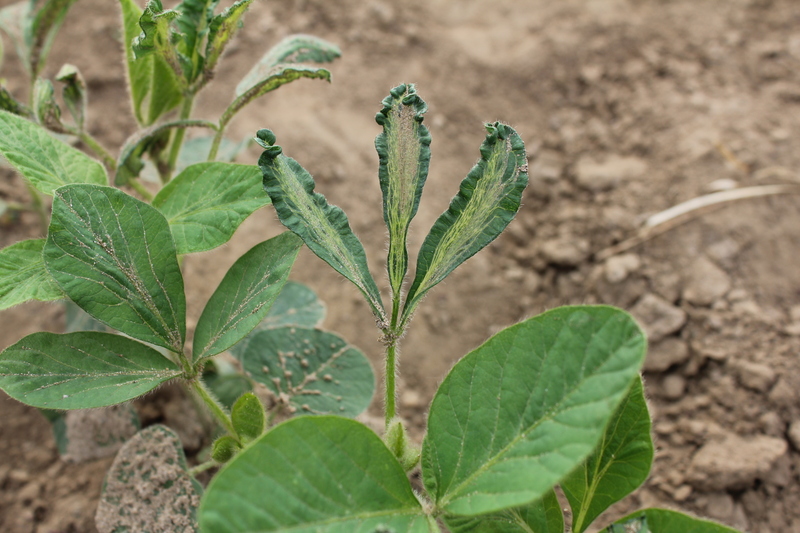 The below image is a perfect depiction of hormonal herbicide injury on soybeans, particularly when the herbicide has been applied to the soil prior to crop emergence. Typical leaf distortion as the result of 2,4-D applied prior to soybean emergence but ignoring the 7-10 day pre-plant interval. In the United States, a glyphosate + 2,4-D Ester application made 7 days prior to soybean planting is a pretty standard treatment in both “Roundup Ready” and non-GMO soybeans. The potential to see the crop injury shown in the image above depends largely on 3 factors. The first and most important is the interval between herbicide application and soybean planting. In the U.S. a minimum interval of 7 days is required. The second factor is 2,4-D formulation as the Ester formulations do not persist in the soil as long as the amine formulations and therefore Ester formulations should always be used. Lastly, the higher the rate, the greater the risk. 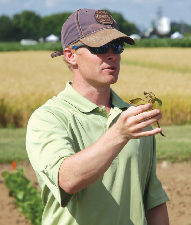 In Ontario, research conducted by the University of Guelph has shown acceptable soybean tolerance to pre-plant applications of 2,4-D Ester (660 g/L) at 400 mL/ac. In this scenario all three factors were ignored and injury occurred. 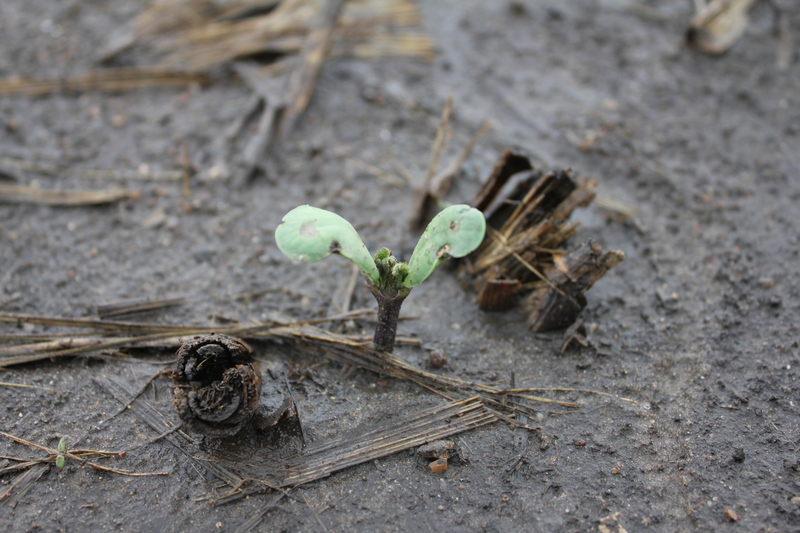 Scenario 7: Do NOT apply Eragon to emerged soybeans! 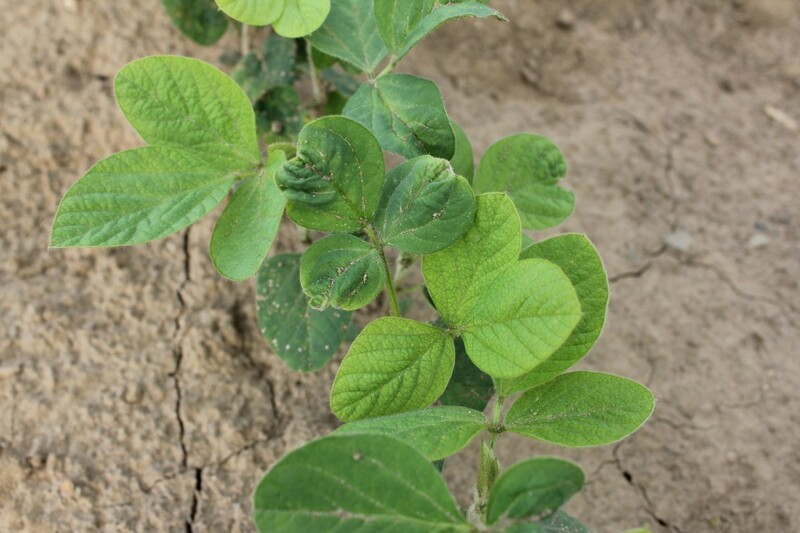 Eragon (saflufenacil – group 14) is a fast acting herbicide that is quite effective on annual broadleaf plants and is only registered for use on soybeans and corn when applied prior to crop emergence. Therefore it is logical that if you were to apply it to emerged beans that severe crop injury occurs (see below). This also applied to Valtera (flumixazin – group 14) and Guardian Plus (glyphosate + Classic + Valtera). It should also be noted that edible beans are extremely sensitive to saflufenacil even when applied prior to crop emergence. 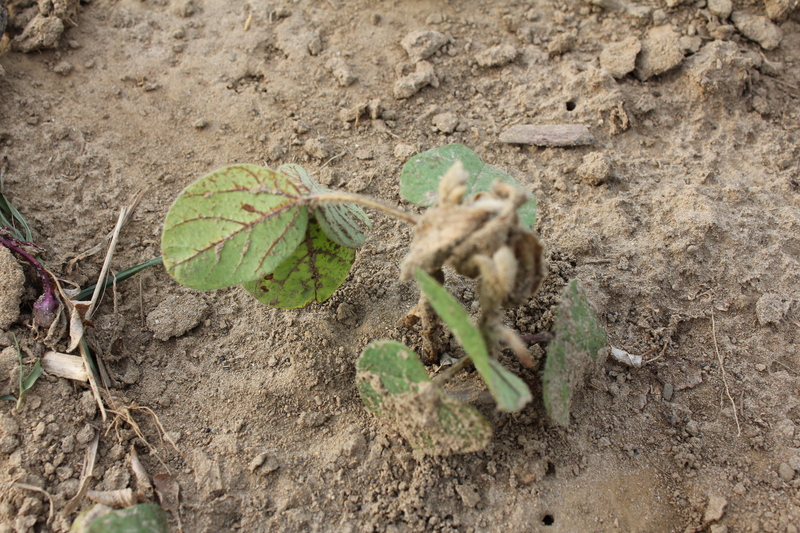 Severe injury as a result of Eragon (saflufenacil) being applied after soybean emergence, a non-registered application timing. Scenario 8: If the crop is up and you still want to use your preemergence herbicide, think again! Just because a herbicide can be applied before and after crop emergence in one crop (e.g. corn) does not mean the same applies in soybeans and edible beans. 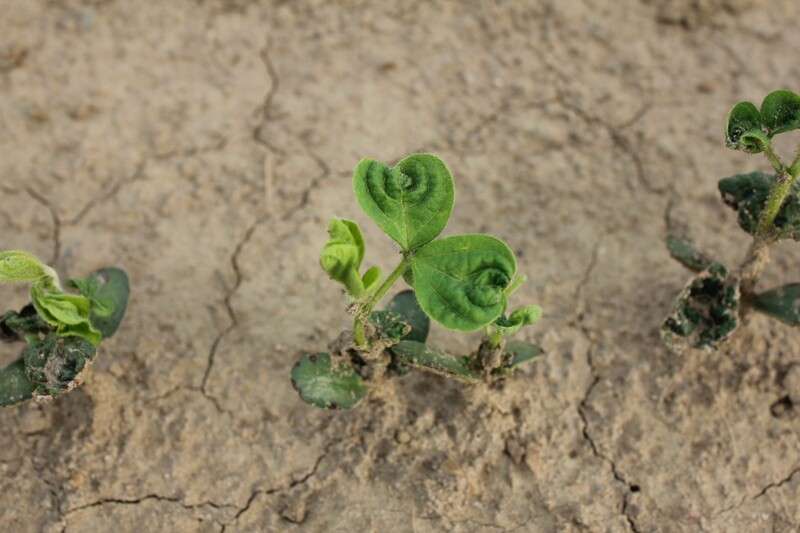 Below is a picture of Dual II Magnum injury to soybeans when applied at the unifoliate stage. Note the two different types of injury symptoms. 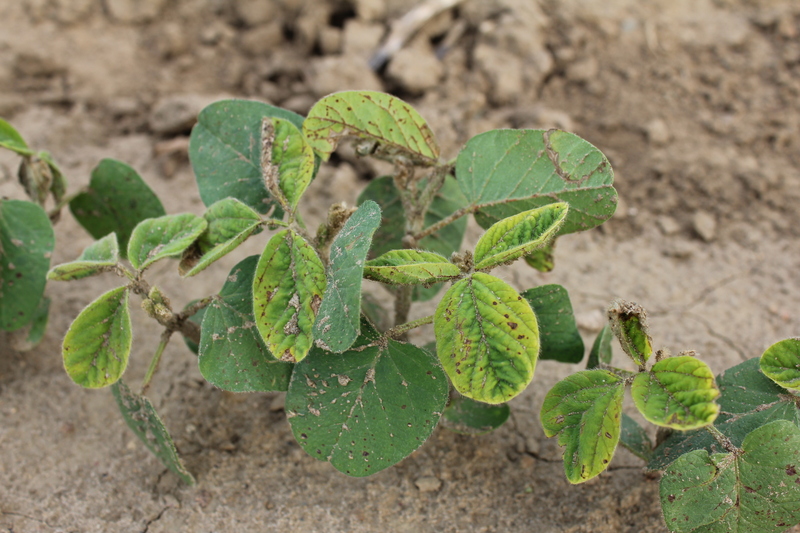 The speckling of the unifoliate leaves most likely caused by the “emulsified concentrate” product forumlation and the other is the “draw-string” leaf distortion of the soybean leaflets caused by the herbicides active ingredient (metolachlor). "Draw string" leaf distortion caused by metolachlor and speckling of the unifoiate leaves casued by the "emulsified concentrate" formulation of Dual II Magnum. The photo below shows off-target drift by a “bleaching” herbicide, in this case Callisto (mesotrione – group 27) onto white beans. The virbant white/yellowing of leaf tissue caused by off-target Callisto drift. 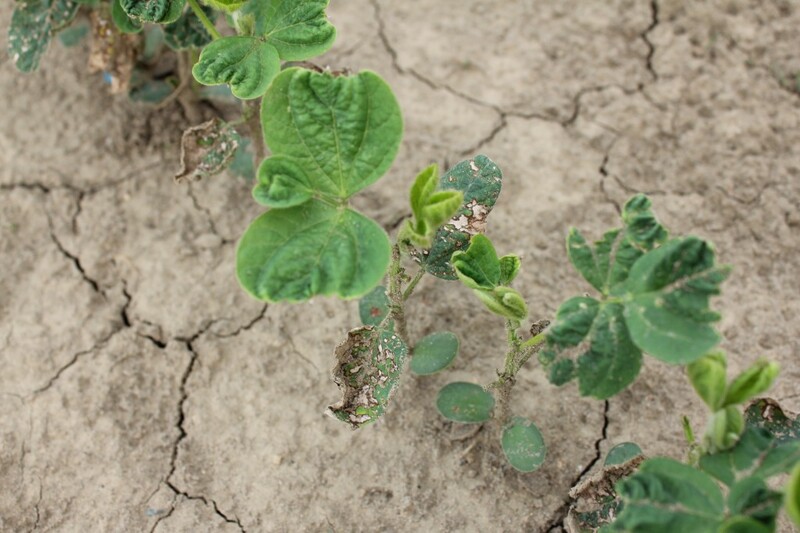 Drift injury is sometimes made worse when certain herbicides are applied to the crop after the drift event occurs and has been documented in the literature. In this particular case, the in-crop application of Basagran (bentazon) that occurred 3 days after application, dramatically increased the severity of bleaching injury. In the photo below, although the entire plot received an off-target drift of Callisto, only the front part of the plot received the in-crop application of Basagran. The injury is less severe where Basagran was not applied.